When it comes to giving bingo players what they want from their gaming experience, it doesn't get much better than the one BetFred Bingo offer. They have some of the best promotions around and it looks like they have put a lot of thought into them too because they are what we would class as 'top of the promotion league'. 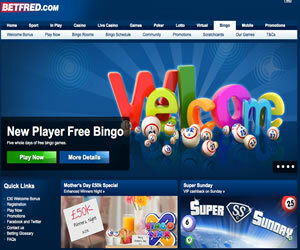 The Site - The BetFred gaming family allow their players to multitask between tabs so they can enjoy playing bingo alongside casino games. It's a really good site to be a part of and you won't find any fancy girly things but instead you will find it's very friendly and easy to navigate, making the games much easier to enjoy! The Jackpots - ' Every players dream is to scoop a big jackpot and at Betfred you are spoiled for choice because even though they pay out huge cash prizes on their regular games, the jackpot games can be massive. The bingo choice is really good too because they have on offer; Joker Jackpot, 75 ball and the ever so popular 90 ball alongside daily jackpots that can be seen during the Linx games. They give out large cash amounts in these types of games on a daily basis and this is no less than £8,000 a day and you can get a piece of the action not once, not twice but three times a day from 12.00pm, 6.00pm and then again at 10.30pm. There is the super monthly BIG game too, which offer a STAGGERING £10,000 but you have to play the game the very last Sunday of the month. As many players say 'You have to be in it to win it'. It's very easy to join at BetFred and there is a £30.00 bonus waiting on you when you make your first deposit and spend only £10.00 on bingo. There are many surprising treats in store for everyone who plays at this top site, including the feeling of belonging to one of the biggest bingo families online today! 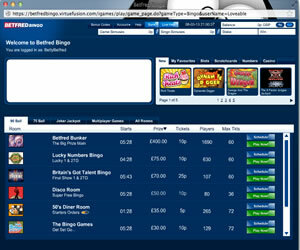 Will you place your bets at BetFred Bingo? You never know you could be their next BIG WINNER! 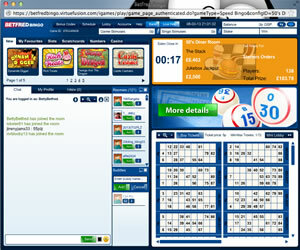 Betfred Bingo offers several different variants of the game online; you will find 75 ball in two variants (line and pattern) and 90 ball bingo. 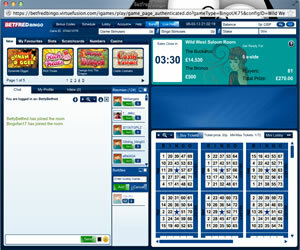 You will also find themed games like Deal or No Deal Bingo, Lucky Numbers Bingo and The Bingo Games at Betfred as well as the card based game, Joker Jackpot. Additionally the site offers a huge array of instant win games like popular games Clover Rollover and Lucky Ladies 88. The minimum deposit amount is not eligible for the welcome bonus. There are no specific wagering requirements on the first deposit at Betfred Bingo simply because you are required to spend your initial £10 deposit on bingo tickets before the £30 free is credited to your bonus account. However for the £20 games bonus the wagering is 10x the bonus. Prior to meeting this requirement all of your winnings are credited to your 'pending' cash balance. This can be used to play games and bingo with but cannot be withdrawn.